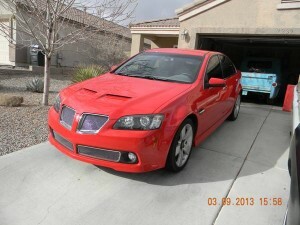 The Pontiac G8 should have been the car that saved Pontiac. It was the right car for Pontiac, but it was brought to market at the wrong time. The G8 was a full-size, rear-wheel drive sedan that was the spiritual replacement for the Pontiac Bonneville and the direct replacement for the Pontiac Grand Prix. The Pontiac G8 was introduced in early 2008 as a 2008 model. 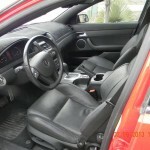 It was manufactured for Pontiac by GM’s Australian subsidiary, Holden. The G8 was a rebadged version of the popular Holden Commodore. Depending on whether you consider the 2008 Grand Prix mid-size or full-size, the G8 was the first full-size Pontiac since the Bonneville departed in 2005. 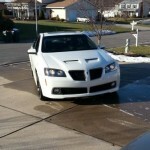 It was also the first rear-wheel drive Pontiac since the Pontiac Firebird departed in 2002. The G8 was offered in base, GT and GXP trim levels. The base G8 came standard with a 3.6 liter V6 engine, producing 256 horsepower and a five-speed GM 5L40-E automatic transmission. Standard equipment on the G8 included: traction control, dual exhaust, electronic stability control, 18-inch alloy wheels, sports body kit, fog lights, cruise control and power windows and door locks. An optional “Premium” package added leather seating surfaces, heated driver and passenger seats, six-way adjustable front seats, rear seat armrest, leather-wrapped shift lever, and a leather-wrapped steering wheel (standard on the GT). The GT upgraded the engine to a 361 horsepower 364 cubic inch V8. with a 6-speed 6L80 automatic transmission. 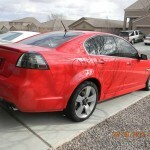 THe G8 GT was capable of reaching 60 mph in 5.3 seconds and quarter-mile times as of 13.8 seconds. Other standard equipment on the GT included quad tailpipes, clear taillight lenses, automatic dual-zone air conditioning, and an 11-speaker Blaupunkt premium sound system. An optional sports package added sport metallic pedals, 19 inch machine-faced aluminum wheels, summer performance tires and an upgraded leather-wrapped Sport steering wheel. 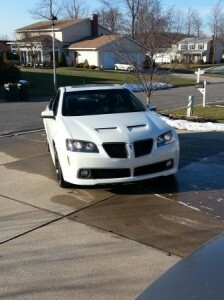 The G8 GXP was the top-line G8. It was equipped with a 6.2-liter 402 horsepower V8 borrowed from the Chevrolet Corvette and a six-speed manual transmission. An automatic transmission was available. The GXP was capable of 0-60 times of 4.6 seconds and quarter-mile times of 12.7 seconds. The GXP came with an upgraded, Nürburgring-tuned FE3 suspension package and larger ventilated Brembo disc brakes. 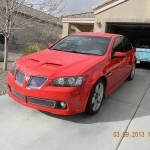 The GXP has a special front and a rear treatment to differentiate it from the other G8 models. Changes the 2009 G8 were minimal. Changes were made midway through the model to the GT that included an additional pair of catalytic converters and the deletion of the center stack oil pressure and voltage gauges. But production of all G8s was stopped shortly thereafter as the global economy took it toll on the automobile industry and Pontiac. General Motors entered bankruptcy in 2009. The General’s first plan to reorganize the company included Pontiac continuing as a specialty make. However, the bankruptcy administrators did not like the plan, as they felt Pontiac was not financially viable. In the end, Pontiac was sacrificed so the Chevrolet, Buick and GMC could survive. Enthusiast do not necessarily agree with that decision. But 2009 would be the end for the G8 and Pontiac. During it run, a over 35,000 G8s were sold. For other Pontiacs, see the posts on the 1967-1969 Pontiac Firebird or the 1964-1967 Pontiac Tempest. To find your own Classic Car or to sell your Classic, see the listings in Classics for Sale. 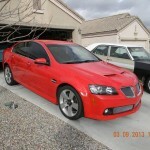 This entry was posted in G8 and tagged Bonneville, Commodore, Grand Prix, GXP, Holden. Bookmark the permalink.